The modern monogram on this wedding invitation is all you need to represent your sophisticated style. Design and wording are printed in your choice of colors and fonts. The 3 for 1 wedding invitation includes three pieces - a wedding invitation, response card and reception card - all for one low price. 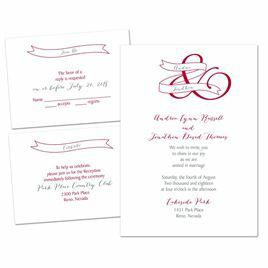 Due to the unique printing process required to offer you this invitation ensemble at a lower cost, all three pieces come on one sheet and are perforated for easy separation. This product features thermography printing. Thermography is a unique printing technique that results in raised lettering you can feel, which adds to the luxurious experience of this printed piece. Includes inner and outer invitation envelopes and response card envelopes. Personalization Options: Choice of ink colors, fonts and wording. I am absolutely in Love with the outcome of this 3 for 1 invitations!!! Everything was just perfect, from the speedy shipping to the texture of the wording....from the packaging to the unbelievable customer service!!! This is a great buy for anyone, u don't have to be on a budget to buy these....it's for anyone to buy. I am truly amazed at how this turned out. I had no idea on what to expect.....but once I opened that box....I immediately fell in love. I will definitely be ordering from Dawn again. Thank u everyone for the wonderful work!!! My daughter and I both are very pleased with this product. There were so many choices. Right on time! They were great!! I would def recommend this product. Great idea of 3 n 1!! The 3 n 1 invites came quickly and everything wasIn order.